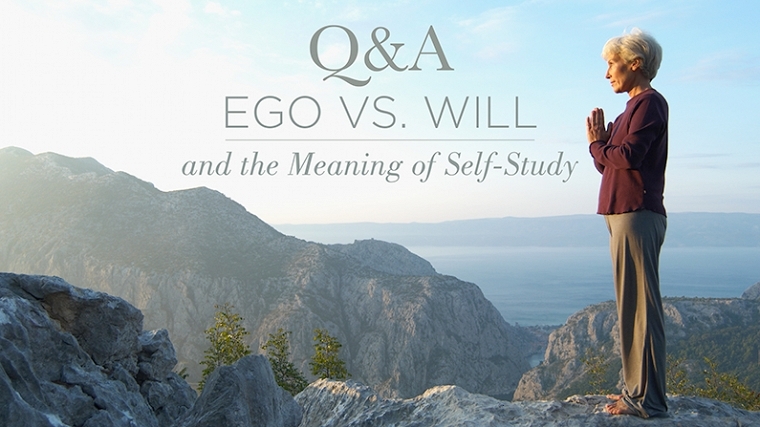 Are will and ego the same thing? My current personal exploration on the subject of will brought me to this article, which I’m sharing for its potential value re: clarification of terms. I found it quite illuminating! Q: Isn’t a strong ego a requirement for success in anything, including spiritual practice? The ego is like a little pool. An egotistical person crouches in that little pool like a frog—his world is small, his borders insecure. He has only a vague awareness of the grove of trees surrounding his pool, and he cannot even imagine the frog-filled marshes just beyond. From his perspective, only his own feelings and voice are meaningful. But the power of will is like a spring whose source is the Pure Being. Will infuses the mind and body with enthusiasm, courage, curiosity, and the energy to act. In yogic literature this force—the intrinsic power of the soul—is called iccha shakti, and it is from this force that all the various aspects of our personality, including the ego, receive the energy to carry out their activities. As you may be aware, remote viewing is a skill involving the ability to view a “target” distant in space – and even time. Remote viewers are given assigned coordinates that are meaningless on any map; they ONLY have meaning to the person directing the protocol. In other words, the director labels a target using a meaningless number, and gives that number to a remote viewer, who then – with no idea what the target actually IS – begins focusing on the assigned number and starts documenting impressions. In the project covered in this video, the remote viewer (Daz Smith, in England) was provided a blind numeric code by the director of this project, Courtney Brown – the founder of The Farsight Institute. The target (again, unknown to the viewer) was the assassination of John Kennedy. The objective was to “see” who killed him. The process of remote viewers tuning into that historic moment is available to purchase as a documentary from Farsight Institute. I have so much on my mind relative to this matter of *will,* this post took on a will of its own and began growing too long too fast! So this will be the first of two, maybe even three, parts. I’ve realized in recent months that so many situations needing healing trace back to this matter of will and how various people tend to use theirs, so discussing it seemed the thing to do. Will has actually been a theme of ongoing learning for me, my entire life. As a little girl growing up in a male-dominated family of “dramatic big people,” I lived amid strong-willed yang energy blasting regularly at high volume. Willful battles featuring loud, demeaning exchanges between my father and brothers were routine. Verbal abuse was the arsenal, with the target’s self-esteem firmly fixed in the cross-hairs. This was apparently my father’s misguided, old-school idea of how to dominate and control his kids… including me, too, when my teens years came along. As you can imagine, what this accomplished was interpersonal alienation, hard feelings, and troubled relationships – not only within the family, but beyond it as well. And as much as I really hate to admit it, I also became skilled at verbal evisceration if pushed far enough. I can’t remember the last time I’ve actually let loose like that, but I can think of a couple of likely scenarios! It pains me to even think that there were times I felt so raw that I’d lash out with such acidic intention. When not managing will properly, a typical outcome for me was to let someone push and push with their bullying behavior until I’d finally explode in exactly the wrong way.